Kington is a small market town on the Herefordshire/Welsh border. The town is close to Hergest Ridge and the River Arrow runs through the town, it is 19 miles north west of Hereford. The town has been in existence for more than a 1000years. Interestingly, although it is on the English side of the current political boundary it is on the Welsh side of Offa’s Dyke, the historical boundary. The population has had strong affinities with Wales, exemplified by men of the area joining with Prince Llewllyn of Powys to sack Hereford in 1055. The uprising was put down by Harold Godwinson (later to become King Harold who died at the Battle of Hastings) and lands confiscated to the King, hence the town’s current name of Kington or King’s Town. The area is surrounded by evidence of human habitation from the Neolithic, Bronze age and Roman periods and is especially noted for its black and white timber framed architecture that can date back to the 15th century. 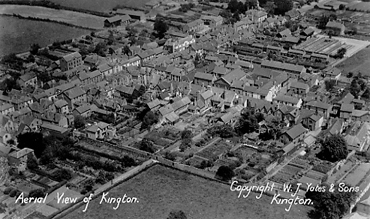 In the 13th Century Kington became a market town mainly trading in wool, on what was an important drovers route. It’s location and history explains why so many long distance footpaths pass through the town, including Offa’s Dyke Path and the Mortimer Trail. 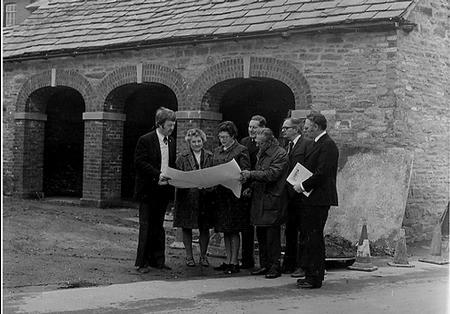 The museum was opened in June 1986, and is housed in what were the stables of the King’s Head Inn that was demolished in 1885, although it has had a somewhat chequered history since that time. In 1988 the building was extended by adding four further rooms in three phases. Two rooms were added in 1991 under phase 1 and thanks to support from the Heritage Lottery Fund and the European Regional Development Fund, phases 2 & 3, two further rooms, were completed in the spring of 2005. In 2013 the museum was redecorated and opened with new displays, including Kington’s Sporting Heritage, Travels with a Metal Detector, and an exhibition from the Turnpike Trust along with a selection of photographs showing Kington, past and present. In 2014 displays included Kington’s musical and sporting heritage. The museum aims to show the history of the town through local eyes. The collection is formed from items received from residents of the town, and the immediate surrounding areas, together with items from further afield that have a link with this region.